Control / Sell tickets at the door: is Wifi part of your event ? You are probably asking yourself whether you need an internet connection or not to check guests in and control the access, or to sell tickets at the door. Find below how Weezevent answers your concerns with its all-in-one solution. What can I do without Internet connection ? Paper listing edited by Weezevent : you have a permanent access to your guest lists, you can download and print it by last name, first name, ticket no. or by type of tickets. This list comes with a box easy to check. In order to download this list, connect yourself to > Access Control > Access Control Lists > BUTTON “Download this list in PDF control format. Using your iPhone, iPad or iPod together with WeezA­ccess app : turn one or several of these devices into a mobile box office with our WeezA­ccess free app and manage your attendees without internet connection. However, be sure to upload via an internet connection the relevant Access Control list, if you don’t want to be blocked once on your event site. Once this database saved on your device, you get access without using internet, so there will be no updating and no real-time sales tracking. Furthermore, when using many devices that don’t talk to each other, the same ticket/bar code could be scanned more than one time. That kind of scenario can lead to fraud. 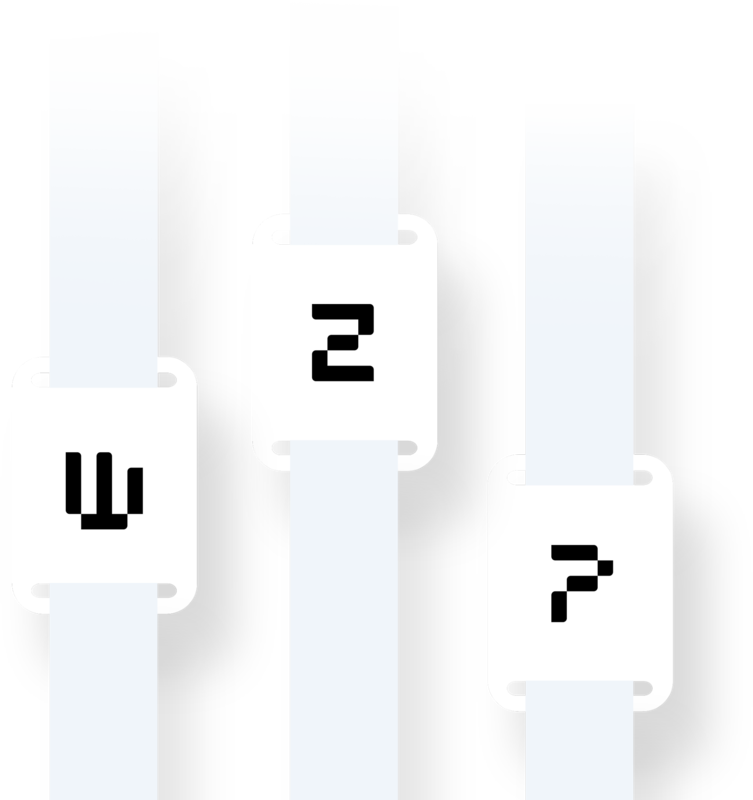 After the event, the device can be synchronized to get locally stored data on each device and then go online to get the list of present parti­cipants (a « validated » column can be found in the export of the attendance list). Rent profes­sional scanners via Weezevent : you don’t own an iPhone, iPod or iPad or for comfort and performance reasons, Weezevent can rent you some iPods equipped with a profes­sional bar code reader (WeezA­c­cessPro). 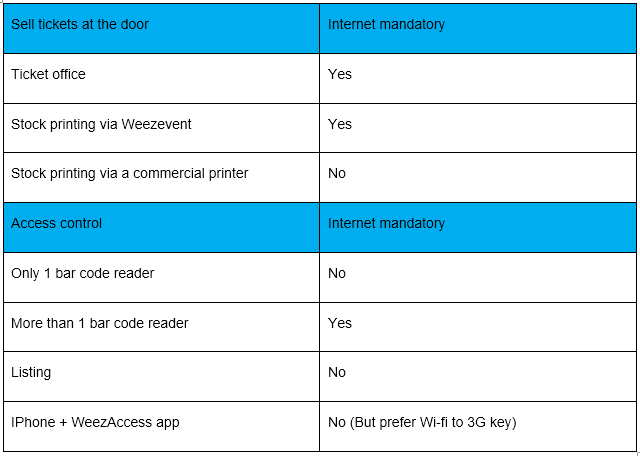 As those devices use the WeezA­ccess free applic­ation, they don’t require an internet connection (please read the above paragraph to learn about this matter). By printing ticket stock via Weezevent : if the event is not sold out, you may want to print a ticket stock of each ticket type available. Use this function called « Stock printing » (menu Sell > Stock printing) to generate one or several PDF containing one ticket per page, ready to be printed using any common printer. Be careful ; proceed to this editing before uploading your access control list if you want those tickets to be scannable. And you won’t receive any commission ! If you are equipped with a thermal printer compatible with our service, use it to print these tickets. If you want to balance once the event is closed, think about deleting your unsold tickets from the Attendance List. By printing tickets via a commercial printer: if you want a high quality product or because it’s more convenient, you may ask a profes­sional to print perforated tickets. Though this is not a requirement, but if you want to scan those tickets, don’t forget to import from Weezevent (menu Sell > Distrib­utors > Import distrib­utors > other)the bar code series generated by the printer. What can be performed with an Internet connection ? Using your iPhone, iPad or iPod together with WeezA­ccess app or with our WeezA­c­cessPro : you keep track in real-time of the number of attendees who were scanned or expected to attend, about the filling up rate, or to check if Mr.Dupont was admitted to the event. 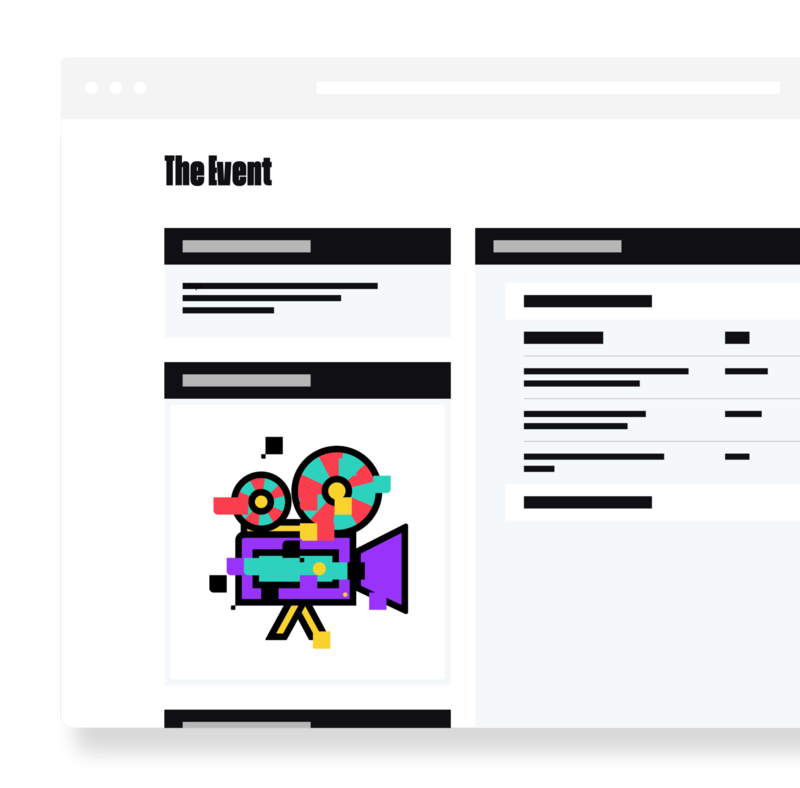 Wherever you are on the site of your event, the connection gives you a direct access to all those precious data. It becomes easy to install several Access control points as the bar code readers are perman­ently linked through the Wi-Fi network. And you will under­stand that as those devices are synchronized, it makes fraud impossible. You also get a quick overview of the level of attendance (don’t have to add each scanner timer). Another important advantage is that on-line and on-site sales can be let open if your event is not sold out. - You face a Wi-Fi failure during your control ? No problem ! Our asynchronous scanners will stay opera­tional no matter what ! They will resyn­chronize once Wi-Fi will be back ! Through my Weezevent interface on my PC or Mac :if you don’t have any scanner, you can use the Weezevent interface to validate directly attendees ! Proceed to your event management and then the « tool box » icon at the top right of the screen => Access Control => Access Control Lists => Button « See attendees of the Access Control List » => Validate. You can search by last name, first name, bar codes or ticket no. 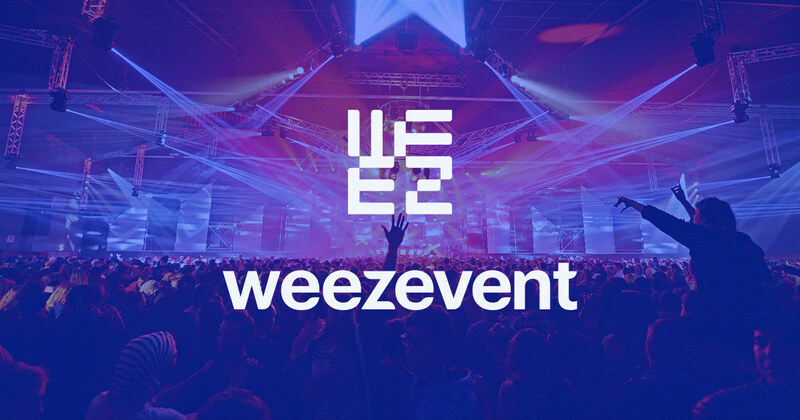 Use Weezevent ticket office : when you have a stable connection to the internet, the best way to sell tickets at the door is to use our ticket office because it is directly linked to your Weezevent account, and update in real-time all your entries. Also, the sold tickets are immedi­ately scanned. In case of theft of blank tickets, those cannot be scanned at the terminal contrary to pre-printed tickets. Back-up solution : if you depend on internet for your point of sales, if you use Weezevent ticket office partic­u­larly, think about having a 3G/4G USB key to be used as a temporary back-up. Be aware that this method can be quite unstable because it depends on the cell network of each user (Orange,Rogers, Bell) and consequently consider it only as a back-up option ! (Contact us) By default, you can print a stock of tickets to be used in case of failure of your online service. For large events : hire a local company specialized in providing internet network on the site. Checking your install­ation : if you have any doubts concerning your install­ation, don’t hesitate to ask us what we think about it, we will ask you the right questions ! A Weezevent technician by your side : if you want to be sure everything goes smoothly and to be supported with team training, organ­iz­ation and dispatching … you can order one of our technical experts according to a daily wage of 400$ (transport and catering at the expense of the organizer). In case of emergency : if you own a smart­phone, use its sharing connection (depends on the cellular network and the battery runs down quickly) to connect tempor­arily your devices. Technical support : if you meet diffi­culties during your operation, call us at (01 85 07 75 75) during business hours or call the technician on duty (01 85 07 75 76) reserved to organ­izers on week-end and evenings after 7 p.m. If you want to learn more about specific technical internet features, go to our technical support section. The different control solutions are briefly described in your organizer interface, go to Access Control > Control solutions.